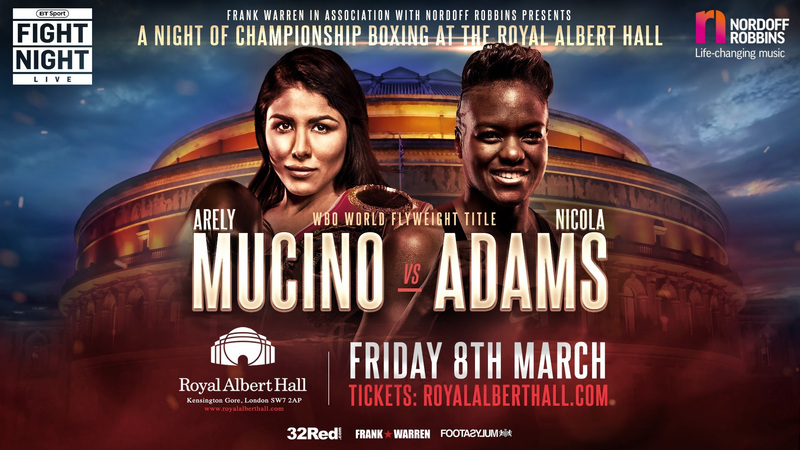 NICOLA ADAMS OBE WILL be hoping for a double celebration on March 8th. Britain’s most successful ever female boxer will bid to become a professional world champion on the same day that females across the globe unite to celebrate International Women’s Day. The 36-year-old has long been the Leading Lady of British sport and now aims to add the WBO world flyweight title to her two Olympic gold medals and numerous other gongs. International Women’s Day is celebrated each year and represents a focal point in the movement for women’s rights. Adams’ own celebrations will take place within the salubrious surrounding of the Royal Albert Hall and the occasion will certainly be marked with a few trademark right handers. The significance of the March 8 date did not escape the Lioness when she rocked up in South Kensington to set the ball rolling on the promotion of her date with destiny that comes after just five previous professional fight nights. “I am absolutely over the moon, really excited and can’t wait to get going,” reacted Adams to the official announcement of her world title assignment against the experienced Mexican Mucino. “I am determined, training hard – and this is the reason I turned professional. I achieved everything there was to achieve as an amateur and I now want to win a world title as a professional boxer, just like my hero Muhammad Ali. “To think that he boxed in the same arena as I am going to be boxing in is unbelievable for me. To come away with a world belt and to call myself a world champion is every boxer’s dream. “I just can’t wait to get in there, to perform and prove to people that I belong at world level. I am hoping all the fans will come out to support me and all the other boxers as well because it will be an exciting night of boxing. “Even if they can’t make it out, just watch it at home live on BT Sport. It will be a fantastic night and I just can’t wait to get going. “This is where it is going to happen and on March 8 I will be ready. I am telling you now, that belt is staying here with me. “Winning it will be right up there with my Olympic medals and to be able to do that here in London at the Royal Albert Hall on International Women’s Day as well will mean everything to me. Frank Warren added that he is convinced the timing is right for Adams to take the professional plunge into the elite end of the sport. “Nicola has obviously broken lots or records along the way with being a double Olympic gold medallist,” added the promoter, who has guided her professional career from the beginning. “She will be the first female professional to perform at the Royal Albert Hall and will be fighting against a world champion who has had roughly six times more pro fights than Nicola has had – so it is not going to be an easy fight for her, that is for sure. “Nicola is a winner and has a winner’s mentality and I am convinced she will come away with the belt. This is history making. Elsewhere on the show, heavyweight prospect Daniel Dubois (9-0) boxes in the same venue that previous British heavyweight greats Lennox Lewis, Frank Bruno and Henry Copper boxed in. Dubois faces the tough California based Romanian Razvan Cojanu. Liam Williams puts his newly won British Middleweight Title on the line against Brentwood bruiser Joe Mullender. Archie Sharp defends his WBO European Super Featherweight title and 14-0 unbeaten record against 11-0 Lucas Ballingall. Johnny Garton will also be in action defending his British Welterweight Title.